A good friend of ours, who we think has a secret watermelon farm somewhere, has been gifting us with these humongous, beautifully red and sinfully sweet orbs once a week for the past three weeks. As much as I love watermenlons and think that summers are just not complete without them, with just the three of us who really eat watermelon in the house, it has been a chore to get them down (to say the least). So I’ve frozen bags of them for slushies and our neighbors have been mighty pleased with us for sharing our good fortune. They don’t realize they’ve been doing us a favor! Anyway, I have been trying to switch up ways to serve watermelon as even the two girls who usually help me polish them off are getting watermelon over load. So last night, I made a watermelon salad to go with the pizza that my daughter made. I was going to make the salad with balsamic vinegar but when I went to go make the dressing, I found out we were out! So, improvise it is… again. Surprisingly, even my husband liked watermelon served this way! 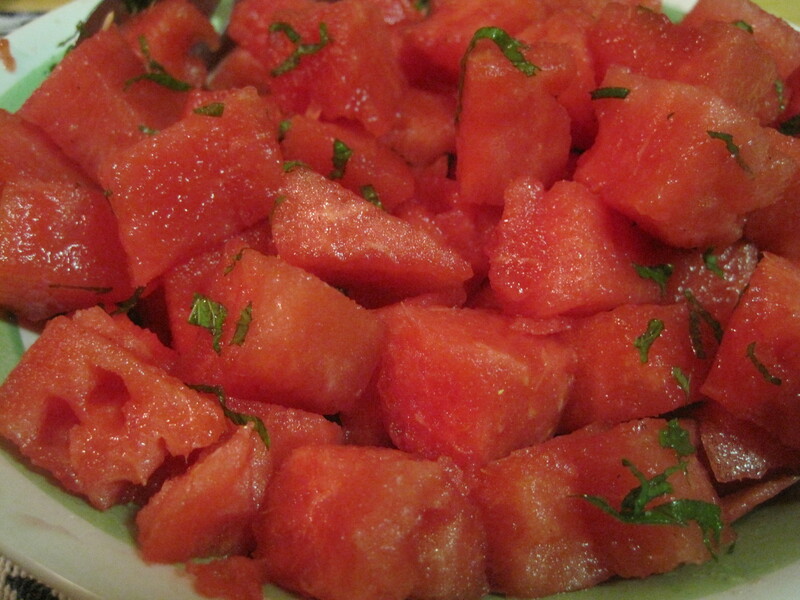 Seed and cut up watermelon and place in a bowl. Stack the mint leaves, roll them then cut them into thin strips. Place them in the bowl with the watermelon. In a small mixing bowl, combine the rest of the ingredients for the dressing and mix well. 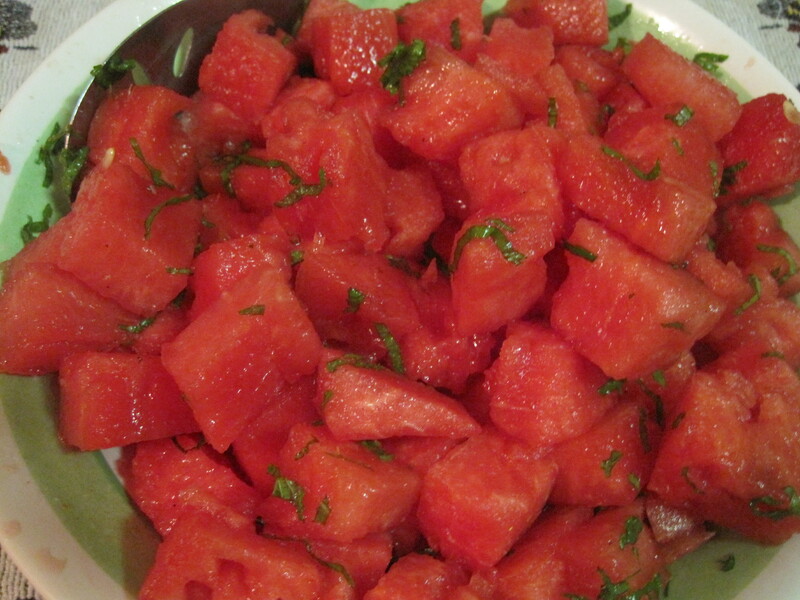 Pour over the watermelon and mint and mix or toss gently. I didn’t put an amount for the watermelon because it just depends on how many people you intend to feed and how much watermelon you have on hand. I used probaby about 8-10 cups of watermelon for the four of us. We had leftovers which I brought for lunch the next day, and the watermelon sitting in the dressing was still delicious! And the dressing, diluted with the sweet watermelon juice was so good, I drank the juice left in the bowl!